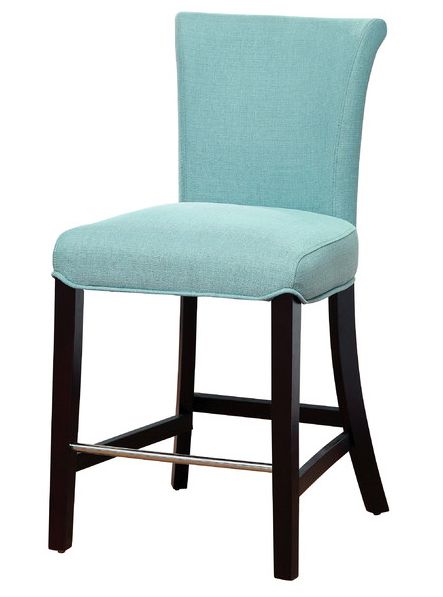 This Marsella Bar Stool showcases a padded seat and back for comfort, tightly upholstered in soft yet durable flax fabric. Set of 2. $359.99 Sale $274.99. Free shipping. Buy here. 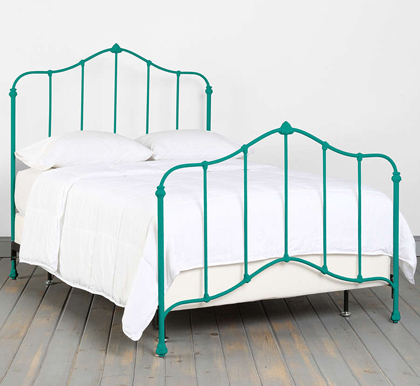 This Turquoise Flora Bed from Plum & Bow is an iron bed in a lovely, vintage-inspired design featuring a fun, fresh color. $749-$849. Free shipping. Buy here. The Kason Cabinet is an artful combination of old-world delight and modern convenience. 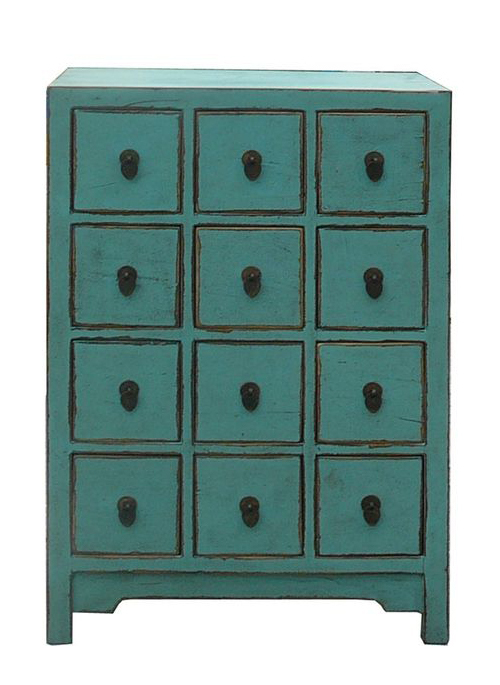 Bronze hardware and a distressed, hand-painted finish give this decorative cabinet the look of an antique, but the hidden cord access will make plugging in your favorite lamp or media component a breeze. Incredibly versatile, a glass-door cabinet like this one is a smart and stylish storage solution in the dining room, family room or home office. $799. Buy here. 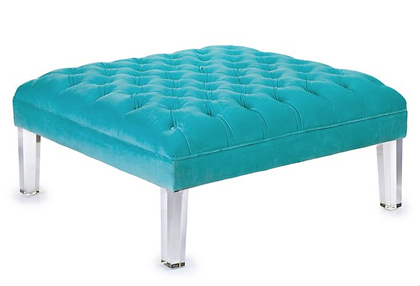 This aquamarine Eliot Ottoman features acrylic legs and upholstered in a polyester velvet making it the perfect blend between classic and modern. Finished with covered button detailing to provide a clean and sophisticated looking ottoman. $699. Buy here. 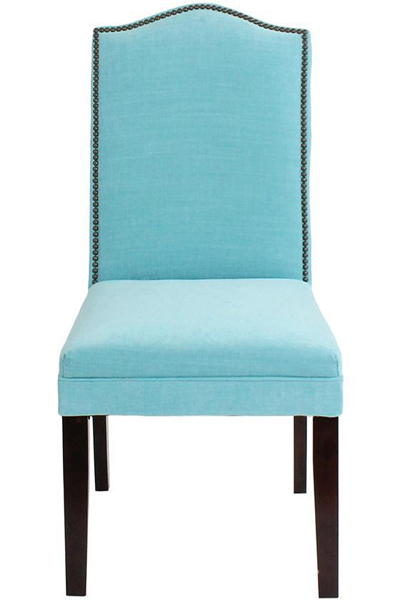 The elegant design of this Custom Camel-Back Parsons Chair with Nailhead Trim will enhance the look of your dining room, home office or living room. The gracefully arched back is accented with nailhead trim for a tailored look; the frame is supported by classically tapered legs. In Jan Light Turquoise. $199. Buy here. The Owen End Table is a retro-style accent piece that looks great on its own or placed next to your sofa or chair. 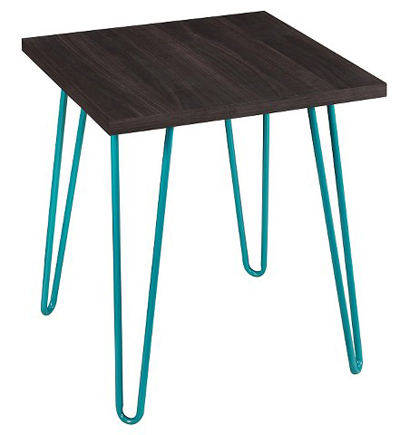 With teal hairpin metal legs, the end table adds a pop of color anywhere it’s placed without taking up too much space. $79.99. Free shipping. Buy here. 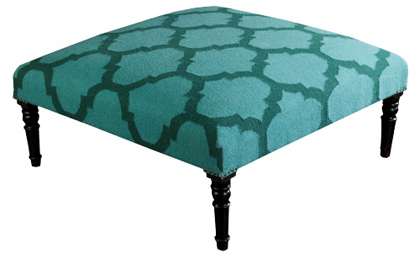 This Surya Frontier Ottoman features brass nailhead trim, long, turned legs for transitional charm and hand-woven wool with solid wood legs. $1,394 Sale $836.40. Free shipping. Buy here. 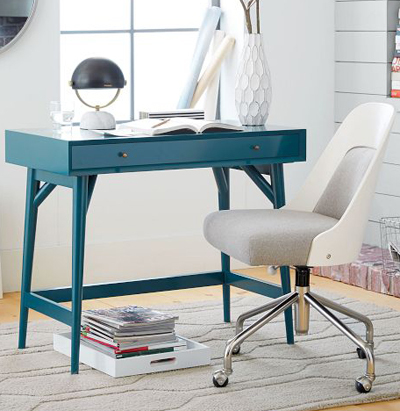 This Mid-Century Mini Desk is designed for those without a lot of extra space. Crafted of FSC-certified wood and finished on all four sides, you could even float it in a room’s center. $399. Buy here. 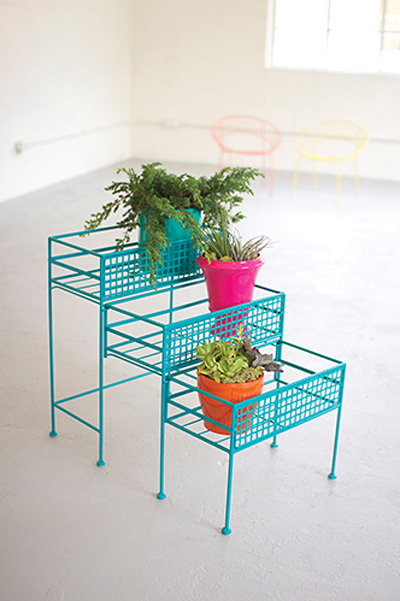 Showcase your green thumb with this slide out Turquoise Three-Tier Pull-Out Planter. Made from industrial metal and coated in a beautiful turquoise, it’s a modern solution for indoor and outdoor gardening. $74 Sale $50.96 Buy here. 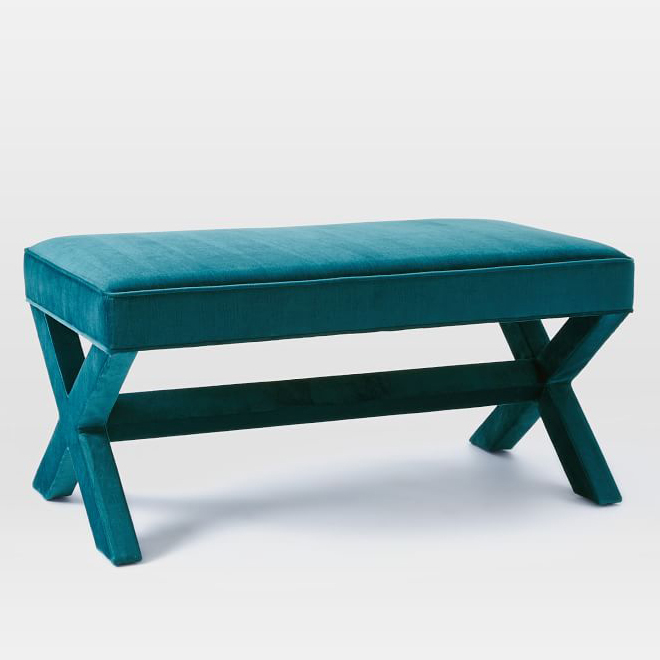 Versatile seating with handcrafted, artisanal glamour. 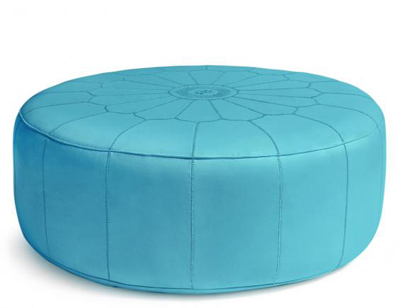 This Jonathan Adler Giant Leather Moroccan Pouf is perfect for adding a pop of eclectic color to your home. Each one is made from the best quality leather on the market and dyed in centuries-old Moroccan tanneries without the use of harmful chemicals. Thanks to the sturdy, high-density foam inside, they have a myriad of uses, from large-scale seating to cocktail table. $3800. Buy here. 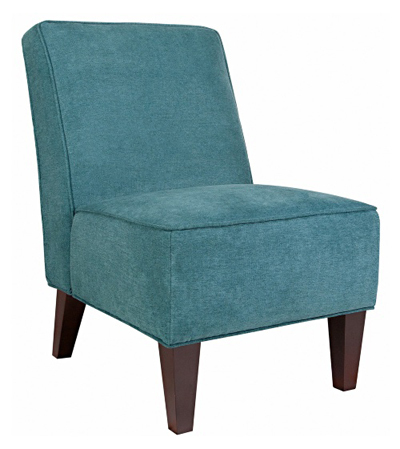 This Teal Blue Dover Parisian Chair from angelo:HOME features a stylish armless diesgn with durable dark walnut legs. $311.99 Sale $199.98. Free shipping. Buy here. 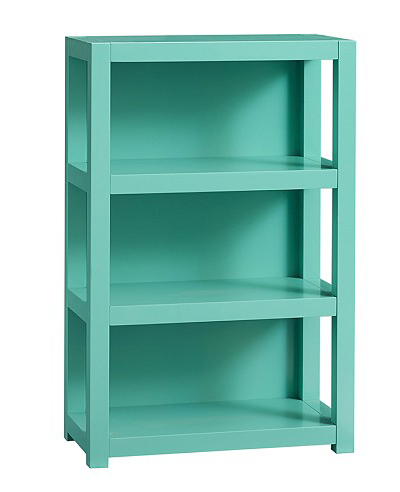 A bold, chunky style and vibrant color options define this Parsons Bookcase, designed with a fresh Parsons spin. $429 Sale $339. Buy here. 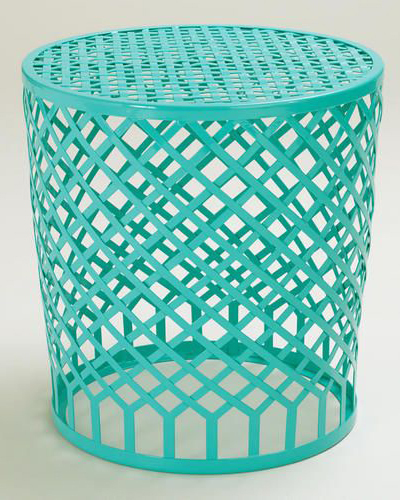 This Weldon Teal Backless Counterstool features a rounded seat that’s been perforated in a fun diamond pattern, welded footrest for comfort, capped feet to protect floors and a softly distressed finish all over. $89.95. Buy here. 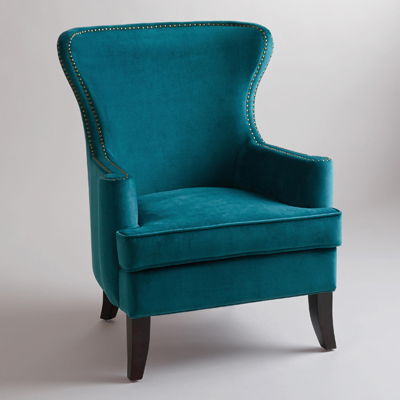 Featuring a broad back, deep seat, and rolled arms, the handsome Pacific Blue Elliott Wingback Chair offers a modern update to this classic silhouette. Finished with tapered, solid wood legs and nail head detail, it makes a stunning yet comfortable seating choice. $329.99. Buy here. 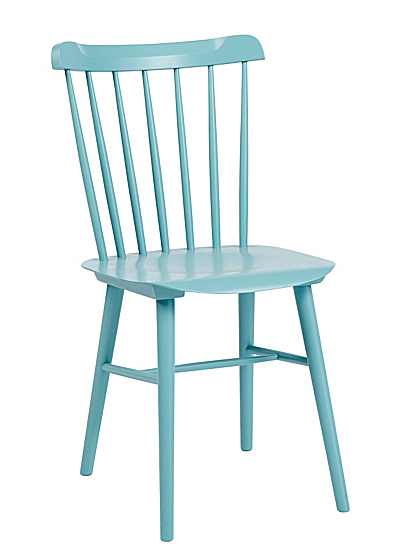 Infuse color into your outdoor seating area with the Blue Round Landon Strap Stool. 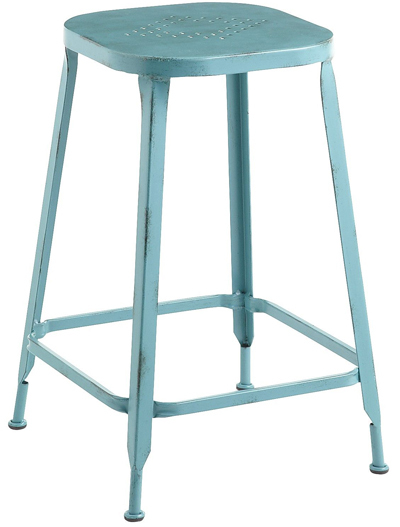 Crafted of durable powder-coated metal, this eclectic stool boasts an open strap construction in bright blue finish for an absolutely fresh look. $79.99. Buy here. 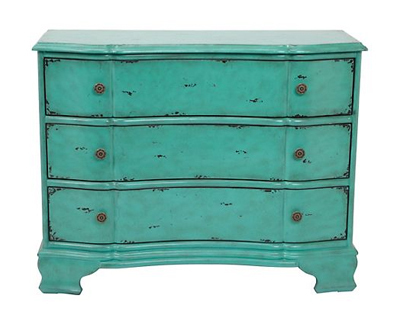 The Crackle Aquamarine Accent 3 Drawer Chest demonstrates a striking use of style and restraint. The three drawer chest has clean lines with subtle curves. 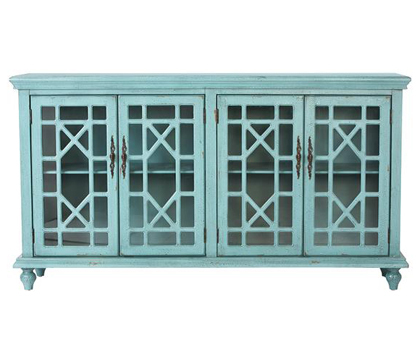 Hand painted with an aquamarine crackle finish accented with antiqued brass hardware. $499 Sale $399. Buy here. An iconic silhouette gets an update with a signature color. 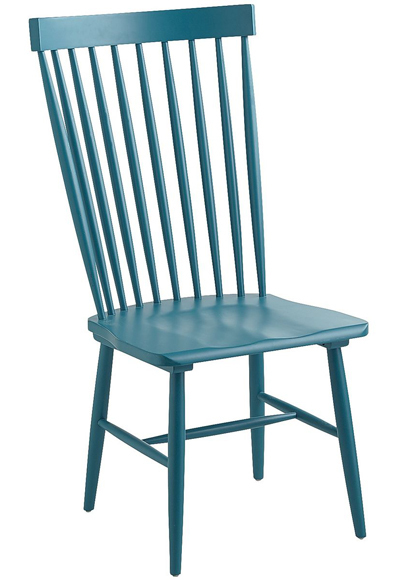 The Tucker Chair in Surf is a downsized version that has the curved back of a traditional Windsor, but its compact frame gives it a modern edge. There’s even a little dip in the seat to cradle you in comfort. Gorgeously crafted of solid wood. $168. Buy here.